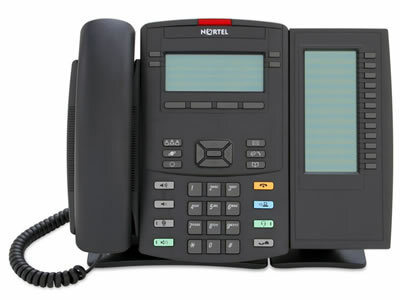 The Nortel 1200 IP Key Expansion Modules (12 Key LCD KEM or 18 Key LED KEM) can be added to the IP 1220 Phone and 1230 IP Phone. The Nortel LCD KEM is a 12-Key programmable, self labeling Liquid Crystal Display Expansion Module. Up to 7 Nortel 12 Key LCD Expansion Modules can be added to any compatible 1220 or 1230 IP Series Phones. The Nortel LED KEM is an 18-Key programmable Light Emitting Diode version Key Expansion Module, equipped with paper label. Up to 2 Nortel 18 Key LED Expansion Modules can be added to any compatible 1220 or 1230 IP Series Phones. Power is provided through PoE or local power supply on telephone when PoE is not compatible or available. Note: The Nortel 12 Key LCD Key Expansion Module is shown here with a Nortel 1220 IP Phone (sold separately).